Alex Bregman came into the 2017 with rather large expectations, to the point where I opined that he might end up in the top five third basemen in Major League Baseball by year’s end in my bold predictions at the beginning of the year. As it turns out, that wasn’t too far-fetched an idea, as Bregman rode a strong second half toward finishing 7th at the position in WAR (3.8) and 7th in Off rating (17.7). With that in mind, it’s an exciting prospect to discuss what exactly the Houston Astros, as well as prospective fantasy owners, could expect from him moving forward. There’s no shortage of things to like there, but the thing that stands out the most is the fact that he has the fifth-lowest strikeout rate at a position with so much elite talent. Similarly, his contact rate came in at the third-highest during the regular season, with an 85.7% mark. His ability to make contact has always been one of the staples of Bregman’s skill set, so the fact that he went so far toward demonstrating it in his first full season is extremely encouraging. You’d like to see that walk rate come up a touch, especially because a 3.68 pitches per plate appearance mark is even lower than when appeared in the previous season (3.84). He’s also not necessarily free swinging, with where that contact rate comes in, as well as the fact that his 44.8% swing rate ranks in the middle of the pack (13th) among the group. Perhaps his approach will develop to the point where more walks are in the cards, but he reads and covers the zone well, as indicated by his unsurprising ability to make consistent contact. Regardless, it’s difficult to fret too much over that aspect, given his success on the contact side. 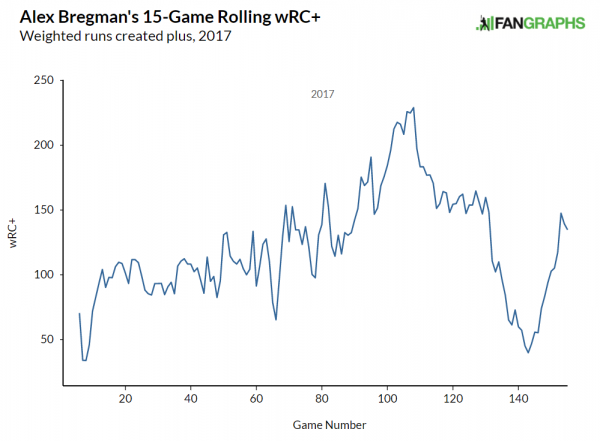 It is certainly worth wondering if we should see an uptick in Bregman’s power moving forward, which would make him all the more enticing as a potential piece at the position. His .191 ISO ranked only 15th among those qualifiers, while his 19 homers ranked 17th. He didn’t make especially hard contact, with a 33.0% hard hit rate combining with a flyball rate near 40% that led to one of the position’s lowest homer-to-flyball ratios, at just 10.2%. You’d like to see him add some strength in order to drive that figure up, especially if he’s going to put the ball in the air as much as he did in 2017. He’s shown impressive strides on the power side, given that he wasn’t considered a big power guy coming out of LSU. Perhaps that could bode well for that aspect of his name moving forward. Bregman also brings one other element to the equation that almost no other third sacker does: he runs. Bregman’s 17 swipes tied Jose Ramirez for the positional lead in stolen bases. His ability to provide offense and be an effective player on the basepaths is part of what made him such an enticing option prior to this year, and he didn’t disappoint. Could he be a potential 20/20 guy in the future? Absolutely, especially if he can find his way on even more thanks to some harder hit balls or a few more walks. There was the slow start and some tail-off at the end, perhaps due to a season that featured over 600 plate appearances, but he managed to maintain a relatively average to above-average presence for the entirety of 2017. That certainly would appear to bode well for him moving forward. We know what he does well. He’s a high contact guy, who runs the bases well, and supplies enough power to be valuable on that side. If he can build on some of that and maybe drive up the walk rate ever-so-slightly, while potentially stacking a few additional extra base hits to that .191 ISO, and a top five player at the position will be far closer to a reality than even now. We hoped you liked reading Thinking About Future Alex Bregman by Randy Holt! With 20+ games started at SS, he should be eligible there in most leagues. And (depending on your format) I’d argue SS is thinner that 3B. Machado is out. So after the Correa/Seager/Lindor tier, isn’t Bregman the next obvious candidate? Bregman is a SS in almost all formats with 21 starts and 30 games overall at SS this year. I mean, you certainly might draft him behind one of the top 4 or 5 SS and use him at 3B knowing you have a damn good backup at SS if needed, but outside that he’s going to be used at SS. It’s a little like Buster Posey. Sure he’s a decent 1B but nobody actually uses him there. Next year it’s going to be Anthony Rizzo with his 2B eligibility thanks to the goofy rules that make him eligible there. Actually the potentially fun eligibility dance next year may be Austin Barnes if the Dodgers try to get him some more playing time. He has eligibility at C of course, but with 4 starts and 20 games at 2B he has eligibility there as well.